Italia usque ad annum 450 a. Ch. With large separate cartouche “Latium”. 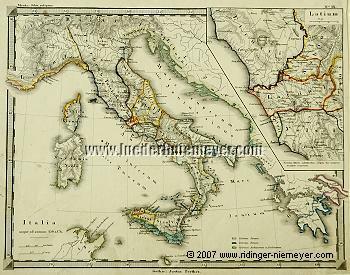 Historical map in steel engraving colored in outline. Gotha, Justus Perthes, c. 1850. 7⅞ × 10 in (20 × 25.5 cm). – MENKE, ORBIS ANTIQUUS IX. – With Corsica. – Up to Marseilles + Athens.